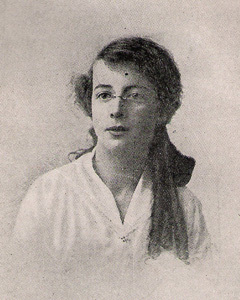 In 1914, Dr. William J. Crawford, a lecturer in mechanical engineering at Queen’s University of Belfast, Ireland, began investigating the mediumship of 16-year-old Kathleen Goligher (below). The phenomena surrounding the young girl included communicating raps, trance voice, and table levitations. 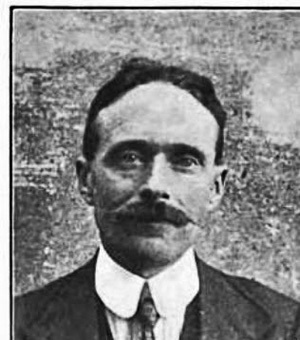 In all, Crawford had 87 sittings over some two and a half years with the Goligher Circle and detailed his research in four books: The Reality of Psychic Phenomena (1918), Hints and Observations For Those Investigating the Phenomena of Spiritualism (1918), Experiments in Psychical Science (1919), and The Psychic Structure of the Goligher Circle (1921), all published by E. P. Dutton & Co. of New York City. Born in New Zealand, Crawford received his D.Sc. from the University of Glasgow and authored a number of books, including Elementary Graphic Statics and Calculations on the Entropy-Temperature Chart, before undertaking his research of psychic phenomena. This “interview” is based on the four books mentioned in the first paragraph. Except for words in brackets, inferred and inserted to permit a flow, the words are his. The questions have been tailored to fit the answers. Various English words, e.g., colour, sceptic, centre, etc. have been Americanized. When Crawford refers to “operators,” he is speaking of spirits. Dr. Crawford, how did you become interested in psychical research? I believe you referred to the type of table phenomenon you initially experienced, where the sitters have their hands resting gently on the table, as “contact” type, while that involving a medium like Kathleen Goligher, when no one is touching the table as non-contact. Would you mind explaining the contact phenomenon? What causes the table to move if muscular force has nothing to do with the matter? Would you mind describing the process involving Kathleen Goligher? How long does this rapping go on? Do you know how the rappings come about? Is Miss Goligher in a trance when the various phenomena are produced through her? So you recognize that there is such a thing as unconscious fraud with some mediums? What kind of person is Kathleen Goligher? Do you have an opinion as to whether these “operators” are spirits of the “dead” or some aspect of the subconscious? This interview will be continued at the next blog post here on January 3. In the meantime, Happy Hanukkah, Merry Christmas, Happy New Year to all. Thanks to Spiritual Researcher for giving the link to Michael Nahm’s comments relative to my review of the four Crawford books in the SSE Journal. The corrections seem to be primarily technical ones, i.e., I referred to 87 “sittings” when it should have been 87 “experiments,” more than one experiment carried out at a particular sitting. Also, I said Crawford studied her over a 2 1/2 year period, when he actually observed her over some six years. I gather that the 87 experiments reported by Crawford were within the 2 1/2 years and that he had additional sittings and experiments with her. I mentioned Goligher’s four sisters, when it should have been three sisters and one brother. Clearly, I was careless in all that, but nothing that Nahm says seems to detract from Crawford’s credibility; if anything, Nahm adds to it. I could have said much more in my review, but I believe I had a word-length limit and had already exceeded it with what I did write. As for Wikipedia, does anyone really accept anything Wikipedia has to say about paranormal subjects? As SR points out, the Dingwall comment was hearsay. Dingwall, who had the reputation of being a debunker, would have had to have been a very old man when he told Blackmore, another debunker, about Crawford’s alleged confession. Such a confession is certainly not consistent with Crawford’s letter to David Gow, as mentioned above. Nor is it consistent with the observations of Sir William Barrett and Whatley Carrington, both of whom reported witnessing phenomena with Goligher, even if Carrington didn’t witness anything the second time he sat with her. It is not unusual for mediums to have days in which nothing happens or for them to lose their powers over time. My guess is that Dingwall or Blackmore are confusing Goligher with Mina Crandon, aka “Margery,” who supposedly said something in jest to Eileen Garrett, which Garrett took to mean that she was admitting to fraud. Dingwall was involved in the Margery investigations. Here again, it is hearsay and very likely taken out of context. The evidence is overwhelming that Mina Crandon was a genuine medium and that he so-called fraud was the inability of some researchers to understand what was going on with the ectoplasmic arm that extended out from her body, the “Walter arm.” The researchers would have had to admit that Walter, a spirit entity, actually existed to give any credence to the phantom arm. They would have had to admit to spirits to prove or disprove spirits, turning the whole scientific method upside down. Come on now. These are absolutely worthless comments. If the biologist Nahm is such an ‘expert’ of parapsychological things how about a little specificity when he writes about them. Just name the “well-known physical medium”, tell us about the “phenomena produced in a fraudulent manner.” Then don’t use your own reference to a ‘just mentioned swindler’ when you haven’t “mentioned” who the “swindler” is and how he swindled anyone. Of course one can play it safe by not including any specificity in one’s writing so that no one will be able to criticize anything that you say. After many years following reports of psychic phenomena and reading a multitude of books about them, I am getting sick and tired of newcomers to the field rehashing the same old hackneyed comments about fraudulent mediums based upon second or third hand information from evangelistic skeptics; such information often found on Wikipedia, one of the absolutely worst sources of information about non-mainstream topics. I believe Robert was talking about this paper, it is online. He points out some minor mistakes you made. For example Goligher was investigated by Crawford for six years, not two and a half according to Nahm. Michael Nahm is an interesting character. He has written articles denouncing physical mediums as frauds but he is a believer in psi phenomena and the afterlife. On an unrelated note, on the Wikipedia article for Kathleen Goligher it says Crawford confessed the whole thing was trickery to Eric Dingwall. This account seems to be third-hand though taken from Susan Blackmore. I am not sure how reliable hearsay like this is. It is not possible to verify the claim because both Crawford and Dingwall are now dead. The books are still available at bookfinder.com. Put William J. Crawford into the search. Just discovered your blog. Thanks for a very interesting read about Dr Crawford, who I have not known about before. Are any of these books still available at all? Further to my earlier response, I searched my files for Michael Nahm’s commentary, but I was unable to find it. In fact, I couldn’t even find my original review of Dr. Crawford’s books. My books and references are a little disorganized at the time. Thanks for the comment. I don’t recall what Michael Nahm’s comments were, but I don’t think I agreed completely with him that they were errors. I assume I responded, but I am not a member of the SSE and don’t have access to their journals to check on this. Can you refresh my memory as to what the “errors” were? In 2014, Michael Nahm wrote that you have made some errors in your old article about Crawford. Have you replied to Nahm’s criticisms? Sorry, but I am not familiar with the experiment you mentioned. Thanks for your comment. I’m pretty sure it was suicide, since he left a suicide note. I don’t recall the reference, but my recollection is that he overdosed on some medication and that it was the result of domestic issues. I agree with everything you write. Of course, Wikipedia doesn’t. Its writers seem seem certain he was duped. But, that seems to be their attitude on all mediums. On the other hand, Sir William Barrett reported in his book, “On the Threshold of the Unseen,” of joining Crawford in one sitting with Goligher and experiencing a very unusual table levitation. Will give details on this in the next post. Whatley Carrington also reported phenomena on his first visit with Goligher but none on his second. He indicated that her mediumship deteriorated between his first and second visit, and that is likely why Dr. Fournier d’Albe didn’t get much when he investigated her some years after Crawford. The skeptics don’t appreciate the fact that harmony is an essential factor in the production of phenomena, and that a researcher out to prove fraud will affect that will bring negativity to the sitting which destroys the harmony. It sounds like a convenient excuse, but so many researchers observed this aspect of it. Hamlin Garland reported waiting up to four hours for the medium Mary Curryer Smith to acquire the harmonious and passive state necessary to produce phenomena. fter waiting those four hours and getting some fantastic phenomena, Garland arranged for the Smith to travel to Boston from Los Angeles to be examined by a group of scientists there. However, the medium produced very little for the group. Garland then arranged for a more private sitting with Professor Amos Dolbear of Tugts University. They sat for an hour or longer and Dolbear was ready to call it a night when all kinds of strange phenomena began taking place. So many researchers apparently didn’t have the patience for all that and called the person a fraud if nothing happened within 10 or 15 minutes. Thanks for the comment. I vaguely recall reading somewhere that Dr. Crawford’s suicide had to do with domestic problems, but I’m not sure. I look forward to your continued ‘interview’ with Dr. Crawford. I suspect that you have many recourses from which to draw your interview questions and answers. I have always found it best to go back and read those original texts and reports by psychic investigators to get a less muddled account of what actually was going on during the investigations. After reading several snippets from his books I have come to respect Dr. Crawford’s open mindedness regarding the phenomena he investigated and I think that he tried to proceed in a scientific way with his investigations of Goligher and other mediums. Hyslop was a little bit stronger in his statement than Crawford but It appears that they felt the same about the matter. I have to chuckle at Hyslop’s comment as I think it betrays his strong-minded personality as someone who is set in his ways and not open to other views. But maybe that is how we all should think if we really believe in the existence of spirit entities and a spiritual reality. So well done, Michael. Thanks for unearthing these four books, all but lost to history were it not for you. Incidentally, did you ever learn the cause of Dr. Crawford’s suicide?